Let's talk about this last week I had. Why? Because it was pretty epic, to say the least. For one, I almost cut my thumb off. No, I'm not being dramatic (for once), I could see meat. Thumb meat! No one should ever....ever see their own thumb meat. You know- the yellowy/reddish stuff that clearly belongs on the inside of your body? Yeah...that stuff. Nor should anyone ever see it pertruding out of the stupid "cut" they just inflicted on themselves! Gaw!! That's what I get for making more peanut butter, I guess? No way Josè, I refuse to believe that. Actually, I probably shouldn't have been absent-mindedly cleaning that food processor blade while mentally trying to figure out the night before's series of Fringe episodes my husband and I had just viewed. Yeah, that's what it's really about. Stupid J.J. Abrams...and Peter...and Olivia. I also probably should have gone to the doctor and had a few stitches put on...sewed in? Which I didn't. I'm such a scaredy cat. Needles?! Dr's??? Stitches?? No thanks. I've had it done once before and I hated it, thankyouverymuch. I'll just really wrap this pouring-blood scratch I have with a lot more gauze and bandaids and call it a day. Even if it's throbbing down to the bone, shooting pain down my wrist and somehow hurting my index finger as well. I also found out that at 28 years YOUNG, I have developed a crazy little thing called love....I mean- Acid Reflux. Yay! Having never dealt with this stuff before and also having totally figured it ONLY involved feeling like your throat was on fire (HELLO, it's called ACID reflux), which mine doesn't feel like, I was shocked to hear what I was experiencing was indeed that very thing! Go figure. That didn't stop us from having a total blast over the last few weekends though! No cut thumb and acid reflux will stop the Mains from having a good time! NO SIRIEE! That stuff is for babies. Speaking of babies (kind of) we were SO excited to spend one of the weekends with our godson and sweet friends from Arizona! Our "little" guy turned 4 and I couldn't believe it! CRAZY I SAY! Aww, he was just a little itty bitty 1 year old crying hysterically every time I tried to hold him, like...yesterday. Being about all things cupcakes (surprised?) we decided to make him any type of edible cupcake topper he'd like for his upcoming birthday cupcakes, which his mama was getting from a yummy bakery near their house. "IwannaAvengers...and vdeovnvengjIRONMAN....annnnnn cannu do his shield with Spiderman and kfenfgghdGREEN...and I also wanna Batman and avengers, Thor and vnsrgnoirgnSHEILD cwiognioerghifBATMAN....and mustaches and fekggrlhmhkdYOUR BOW TIE...with blue...and dots..."
So he got his Batman, his mustaches, and his lovely blue bow ties with white polka dots. 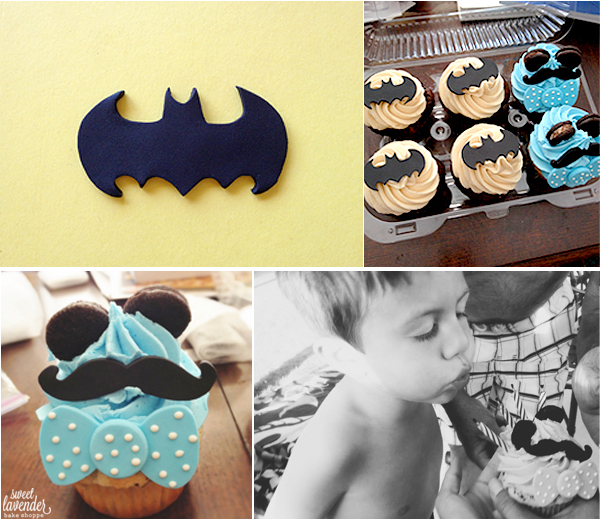 I have to admit, the combination of mustaches and bow ties make his "Cookie Monster" cupcake extremely handsome, don't you think? But sheesh this post was supposed to be about these delicious muffins! I didn't mean to go on and on and on about- oh who am I kidding. I totally did. OH THESE MFFIUNS! --Really iMac spellcheck?? You couldn't figure out that I CLEARLY meant for that word to say "MUFFINS"????? What good are you to me now? Useless. So these muffins were totally created on a whim! There was no plan to make them, no pin on Pinterest...no tab or dog-eared cookbook or magazine. Nadda. I was literally shopping at our local Trader Joe's (HOLLA!) one day, sat and stared at their baking section (like I usually do), and spotted this cool new item- their Gluten-Free Flour! 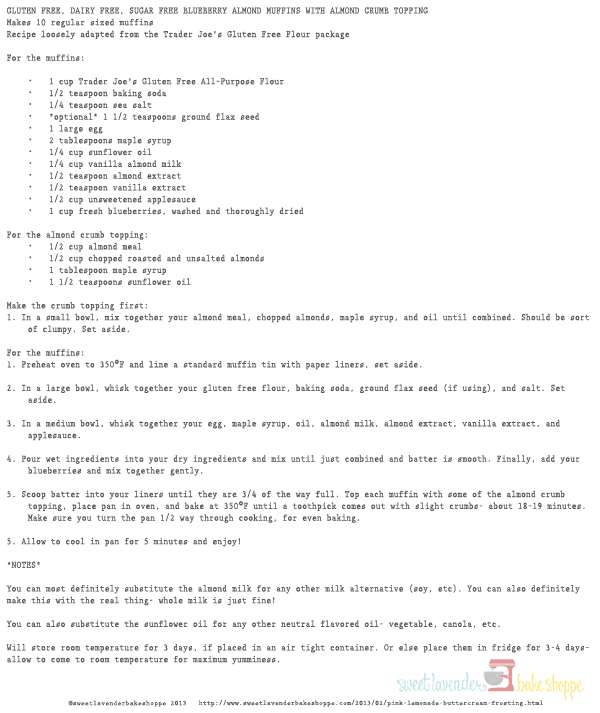 Since I've been so scared of ALL those fancy gluten free flours- I seriously feel like some recipes want you to have like a million flours in your home to make like...one batch of cookies! !- I rarely do any gluten free baking. Sure sure, I've done this pie and these cookies- but neither of those use any "flour". So, I was so intrigued by this flour! It's like everything you need, in one (kind of tiny) bag! Hooray! PluUuUuUus, gluten MIGHT be a big trigger for my newly acquired friend, 'Ol Acid Reflux, so I'm starting to look more into the whole gluten free world. I mean, that's a trigger, right? Anyone out there experience this? Would LOVE to hear any and all thoughts (and advice)! Their all-purpose flour is a combination of brown rice flour, potato starch, rice flour and tapioca flour, for those of you wondering! Annnnnnnd can be measured CUP-FOR-FREAKING-CUP in any regular recipe! I mean, WHAT?! SO cool. I impulsively bought. So happy I did. On the back of their bag was a standard recipe for apple cinnamon muffins- but having just acquired some amazing fresh blueberries (thanks mom!) I wanted to make a blueberry muffin instead. I also wanted there to be almonds involved. Why? Because almonds in baked goods make the world a better place. I also wanted there to be a crumb topping. Why? 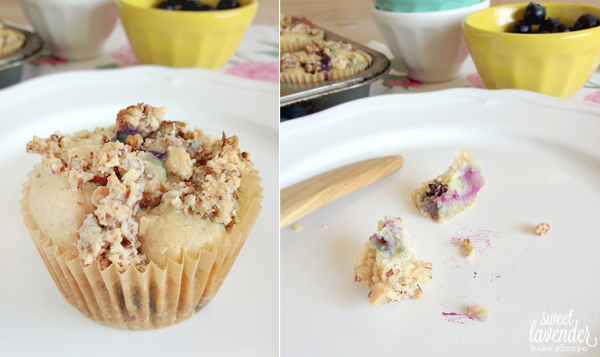 Because muffins should ALWAYS have a crumb or crumble topping. It pretty much makes the muffin. 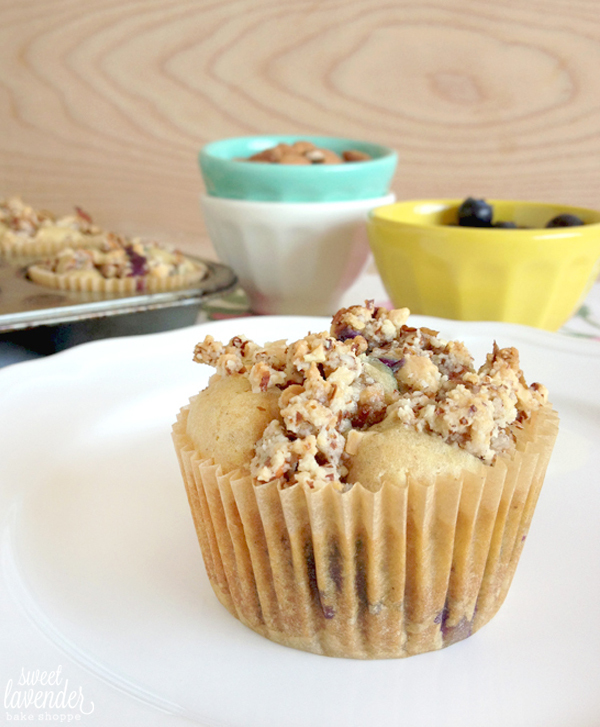 So I got in the kitchen as soon as I could, and played around for a while until I got myself some seriously delicious GLUTEN FREE, DAIRY FREE, SUGAR FREE (yes, there is a sugar substitute, friends) BLUEBERRY PACKED muffins...with that yummy crumb topping. You know, to eat off first. Always eat the tops of muffins first. Especially when crumb toppings are involved. 1. In a small bowl, mix together your almond meal, chopped almonds, maple syrup, and oil until combined. Should be sort of clumpy. Set aside. 1. Preheat oven to 350°F and line a standard muffin tin with paper liners, set aside. 2. In a large bowl, whisk together your gluten free flour, baking soda, ground flax seed (if using), and salt. Set aside. 3. In a medium bowl, whisk together your egg, maple syrup, oil, almond milk, almond extract, vanilla extract, and applesauce. 4. Pour wet ingredients into your dry ingredients and mix until just combined and batter is smooth. Finally, add your blueberries and mix together gently. 5. Scoop batter into your liners until they are 3/4 of the way full. Top each muffin with some of the almond crumb topping, place pan in oven, and bake at 350°F until a toothpick comes out with slight crumbs- about 18-19 minutes. Make sure you turn the pan 1/2 way through cooking, for even baking. 5. Allow to cool in pan for 5 minutes and enjoy! You can most definitely substitute the almond milk for any other milk alternative (soy, etc). You can also definitely make this with the real thing- whole milk is just fine! You can also substitute the sunflower oil for any other neutral flavored oil- vegetable, canola, etc. Will store room temperature for 3 days, if placed in an air tight container. Or else place them in fridge for 3-4 days- allow to come to room temperature for maximum yumminess. 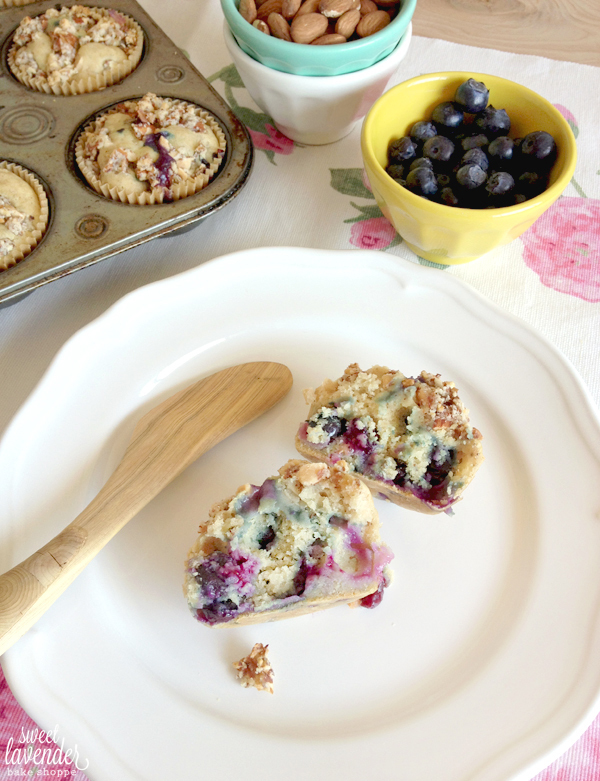 Moist, slightly sweet, PACKED with berries and loaded with flavor- my husband and I seriously couldn't tell they were gluten free! My gluten free world just got WAY bigger. I'm not in the least bit bothered by gory stories of chopped off fingers... but you did your story justice because I got the shivers when you described your finger. well done! the story telling, not the finger chopping. I totally agree! The finger meat and the muffins were totally delicious! Those look SO good! Pinning!!! How are you doing with Gluten-Free? 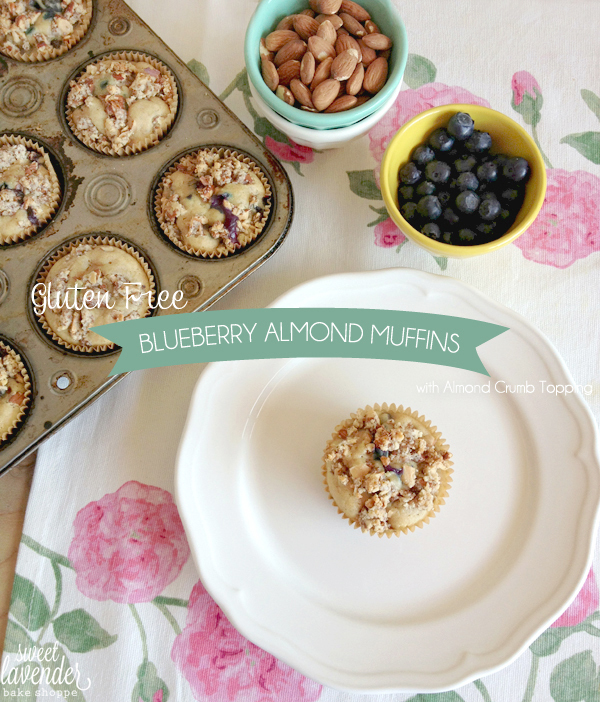 I have a wheat allergy so I am 100% gluten-free and am excited to try these muffins. You will find that to really reap the rewards, you will need to be all in.